Swalwell was county prosecutor in California before running for Congress. Rep. Eric Swalwell, D-Calif., is the latest to launch a run for the White House, saying on ABC's "Good Morning America" that gun control and student loan debt will be key points of his agenda. In an interview Tuesday morning, ABC News Chief Anchor George Stephanopoulos asked Swalwell if he is concerned about backlash in key voting states over his gun control stance. The 38-year-old former prosecutor is a vocal advocate for stopping gun violence. On Tuesday, Swalwell and a group of students and families with ties to Marjory Stoneman Douglas High School will host a Town Hall to End Gun Violence in Coral Springs, Florida. "I’m telling folks, keep your rifles, keep your shotguns, keep your pistols, we just want the most dangerous weapons out of the hands of the most dangerous people," Swalwell responded. "Most gun owners believe that." The congressman also said that he is still working to pay off his own student loan debt - just under $100,000. "It’s never really been top issue in a presidential campaign. It’s going to be for me," Swalwell said. He has been a vocal critic of the president, telling Stephanopoulos Tuesday that Trump "acts on Russia’s behalf too often." Swalwell serves on the House Intelligence Committee, where he is chairman of the Intelligence Modernization and Readiness subcommittee. 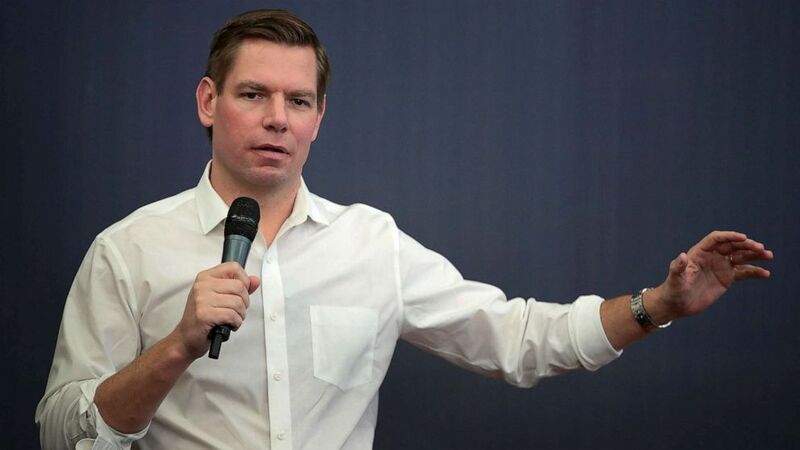 "Just because he wasn’t criminally indicted doesn’t mean that he met the standard of conduct that we should expect from a president, or a candidate," Swalwell added. Stephanopoulos asked Swalwell what he expects to see from the special counsel's investigation. "I think you're going to see that this president, his family, his team, did not say 'no' any time they were offered information by the Russians, and eagerly asked the Russians to keep bringing more," Swalwell responded. Swalwell announced his candidacy Tuesday night on CBS' "The Late Show" with Stephen Colbert. "It's official," Swalwell said in a video clip that "The Late Show" tweeted Monday night. "Boy did it feel good to say that." (Scott Olson/Getty Images, FILE) Congressman Eric Swalwell speaks during an event at the Iowa City Public Library, Feb.18, 2019 in Iowa City, Iowa. Swalwell was originally born in Sac City, Iowa, but grew up in the East Bay area of California. He graduated from University of Maryland in College Park, Maryland, in 2003 and graduated from the University of Maryland School of Law in Baltimore in 2006. He then went on to serve as a prosecutor in the Alameda County District Attorney's Office in California for seven years. In 2012, he was elected to represent the 15th Congressional District. In 2015, he founded the "Future Forum," a group of 50 young House Democratic members who are focused on addressing issues for and giving opportunities to millennial Americans. He has two young children. Swalwell has already made visits to the early voting states of Iowa, New Hampshire and South Carolina.